Congratulations to DiSailsToo, MommaC, and Rileysmom!! You each won $10 of pcpurse to spend at pcLayers.com. Please email me(see link to the right) and I'll hook you up!! 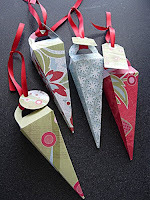 I made these icicle treat boxes and will hang one for each of my 4 kids on the tree Christmas Eve. I'll fill them with some chocolate kisses. I used Basic Grey papers and tags and a free template downloaded from THIS fabulous site. I just printed the template on the back of my papers, cut, scored, and added a tag and ribbon. A craft knife works well for the handle. Aren't these fun?? these are fantastic! 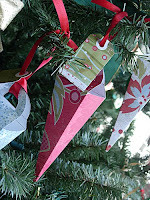 i'm loving all your holiday crafting ideas. (and it's cool to see your BG paper going to such awesome use!) happy holidays.